UPDATE - Monarch have actually gone bust now. No big surprise! A company called Puget Systems is offering to do support and maintenance for Monarch customers. In the interests of web preservation I've left the tale of woe here anyway. 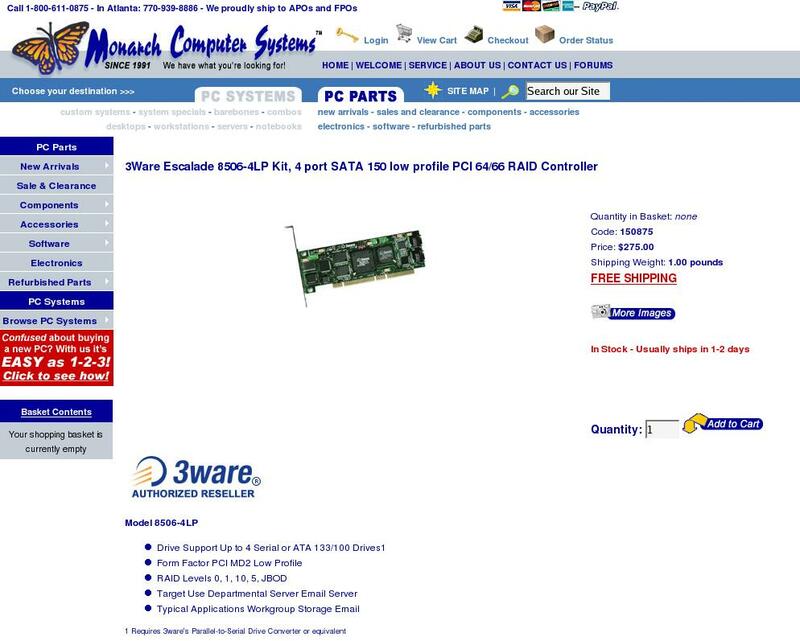 For those of you stateside who order computer bits and pieces, please read the following account of my trying to order a 3Ware raid card from Monarch Computer Systems of Tucker, Georgia. Quite how they've been in business since 1991 with the abysmal service they offer I do not know. I order a 3Ware 8506-4LP raid controller for $275. Website shows it as in stock, 1-2 business days to deliver. Credit card charged for $275. Order submitted to warehouse for processing. No tracking number e-mailed. Call. Left on hold 5 mins. Told 5 cards are on 'my dock'. Order will go out tonight. No tracking number e-mailed. Call. Told computer problems slowed order processing last night, and that order will go out tonight. No tracking number e-mailed. Call. Told item out of stock. Waiting on P/O and when it comes in it will go straight out std. overnight for Friday. No tracking number e-mailed. Called at 8.15am. On hold 5 minutes. Rang back to operator (Chapelle). On hold 15 minutes. Rang back to operator. On hold. 10 minutes. 8.51am back to operator. Complained. Told they're busy with others. On hold 5 minutes. Jeremy picks up. Confirms who I am. Put back on hold. Jeremy picks up. Tells me package did not go out, but is now in, can do Sat delivery. Nobody here Sat. Told them if it is not here Monday then I will cancel my order. Off phone at 8.59am. Good thing it was their 1-800 number. No tracking number e-mailed. Called at 9.15am. No answer. Called back at 9.20am. Spoke to Rick, passed to orders. Spoke to Jeremy. Told that the 3Ware card that came in on Friday was not the right model. Asked to cancel order. Was told credit card would be credited back within 24 hours. On top of that, they never apologised either. Total time from order to cancellation - 1 week and 2 days, and the best part? As of April 4th 2005 Monarch still claim it is in stock on their website. If they bother to check their web referrers, see it and change it, a screenshot from 4/4/05 is here. If you are ever tempted to order from Monarch Computer Systems of Georgia, slap yourself repeatedly until the feeling goes away.